As you hopefully know by now, Hip Hop for Change is a non-profit which combats socioeconomic inequalities and societal prejudices through the implementations of educational outreach with Hip Hop-based curriculum, grassroots canvassing, and local music showcases. I am extremely proud of Khafre Jay, the entire HH4C staff, and the educators, for reaching their 5 Year Anniversary. Yours truly has had the privilege of serving on the board of directors for the past several years, and it’s always been humbling to have my name associated with the organization. 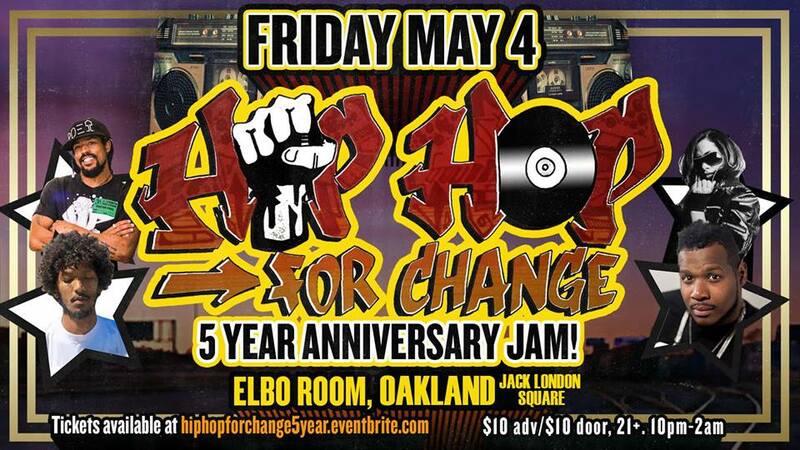 On 05/04/2018, HH4C will be celebrating its anniversary at Elbo Room in Oakland.. yours truly will be rocking alongside comrades Khafre Jay, Unlearn the World (who is HH4C’s education director, and it makes sense because he’s smart as hell), Watzreal, and Breathless. Bay Area OG turntablist Ren the Vinyl Archeologist will be the DJ for the evening. Get your tickets here.